Credit: Image courtesy of the authors of the paper. Scientists from MIPT and several research teams working in Russia and other European countries have been the first to reliably realize and document the phenomenon of water molecular dipoles ordering by confining water molecules within nanocages in a beryl crystal. The results of their work have been published in Nature Communications. In solid-state physics, the notion of ferroelectricity refers to the property of a material whose electric dipole moments, while cooling, align themselves in an ordered pattern. Because the water molecule (H?O) is characterized by a very large dipole moment (approx. 1.9 D, where “D” stands for the debye, a unit of electric dipole moment), one would expect that in liquid water the molecular dipoles should strongly interact with each other and, consequently, align themselves in a certain manner, i.e., demonstrate ferroelectric behavior. However, in liquid water, such ordering does not occur due to the molecules being located so closely that their interactions are dominated by the short-range hydrogen bonds, which suppress the long-range dipole-dipole forces. The situation changes drastically when water molecules are forced to interact with foreign structures/surfaces or are confined within closed cavities of sufficiently small (nanoscale) dimensions. Under such conditions, the role of hydrogen bonds can be diminished by “redirecting” them to these additional interactions, so as to make the interactions between water dipoles come to the fore. The team of researchers devised a subtle and unexpected way of creating conditions when the dipole-dipole interactions between water molecules would be stronger than hydrogen bonding. 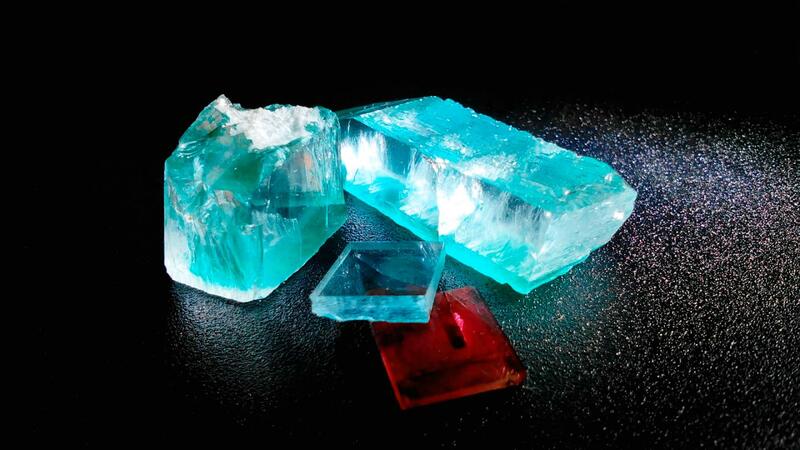 They managed to confine individual H?O molecules in a network of nanosized cavities within the crystal structure of beryl, a mineral that is used as a gemstone–the most famous varieties being emerald and aquamarine. These cavities occur at regular intervals (facilitating mathematical analysis) and, most importantly, are spaced 5-10 Å (angstroms) apart, which means that the hydrogen bonds are negligible (effective interaction range 1-2 Å), while the dipole-dipole interactions (effective interaction range 10-100 Å) still have a significant effect. Ferroelectric materials possess several characteristic properties, or “fingerprints,” which enable experimenters to reliably detect dipolar ordering in a system. For instance, the dielectric permittivity of a ferroelectric is known to vary with temperature according to the Curie-Weiss law. Another example is the notion of the “soft mode,” i.e., a special absorption resonance at infrared or terahertz frequencies, whose parameters have a specific dependence on the temperature. The researchers detected all these ferroelectric fingerprints in water “dissolved” in beryl. “Our team has succeeded in placing water molecules under conditions allowing us to obtain the first-ever reliable observations of the alignment of molecular dipoles of water. As for possible practical applications, their scope could be fairly wide. It should be noted that the researchers now have the opportunity to study this phenomenon under the influence of various external factors–temperature, pressure, the ionic environment, etc., and thus advance our understanding of this phenomenon and its role in various systems, including living organisms,” says Boris Gorshunov, the head of the Terahertz Spectroscopy Laboratory at MIPT. The electric fields, which are generated by nanoconfined water, could play a vital role in various phenomena studied in biology, chemistry, geology, and meteorology, or even in the formation of the planets of our Solar System. In fact, many computer calculations and simulations do predict the alignment of water molecular dipoles, provided that hydrogen bonds are somehow “diverted” to “target” the artificially introduced surfaces or cavities such as carbon nanotubes or two-dimensional metal substrates. However, no firm experimental evidence has been obtained so far for the dipole-dipole ordering of water molecules, although numerous attempts have been made by researchers worldwide.